This whole having a girl thing has been wonderful. But the one area that I’m still adapting is the whole hair-clip thing. See, I’m running into a few problems, like her hair is constantly in her eyes. To attempt to keep the bangs from her eyes, I clip it back. And I have lots of cute clips to choose from. But she takes them out all the time. Sometimes she makes a game of it. Other times it just comes out. The other day I reached between the cushions in her carseat and found 6 hair clips. Seriously. Six. (and almost all of them were a shade of pink). Now I’m checking back there every day. How do you get your little girl to keep her clips in? Of course, since she’s so into removing her hairclips, there’s no surprise that we go through them rather quickly. For each one that I found tucked into her carseat, I’m sure we’ve lost others. The problem isn’t that they slip out. Its that she deliberately pulls them out. So I’m always looking to find new hairclips that are cute and reasonably priced. A few weeks ago, I won a contest at Sami Cone‘s website, where I got to pick a hair clip set for Little from Lilla Hairclips. I had a hard time choosing, and they sent me a few to try out. The Alligator Clips work wonderfully in Little’s hair–on the rare occasion that she doesn’t pull them out, their hasn’t been any slippage. And Lilla Hairclips has a great variety of colors to match all of Little’s outfits (believe it or not, she has a few things that aren’t pink). They also sent a few snap clips which also hold Little’s hair nicely, but I don’t like putting them in because I hate the feeling of snapping clips against her head. I’m very impressed by the variety and the cute styles. I also love that Lilla Hairclips partnered with littlethings, a nonprofit organization dedicated to furthering the education of Congolese girls in the Democratic Republic of Congo. 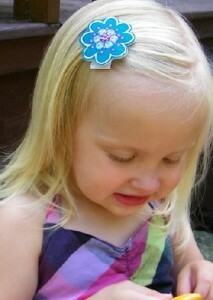 For every hairclip that is purchased, a little girl in the Congo will be sent to school for a half day. For every headband purchased, a little girl will go to school for a whole day. Doesn’t that make you want to buy several hairclips and headbands? Me too. Aren’t they the cutest! And they look so cute on your little one ðŸ™‚ I just love Lilla, their founders and the cause they support through what they do! I was recommended this blog by way of my cousin. I am now not certain whether or not this put up is written by him as no one else understand such precise approximately my problem. You’re wonderful! Thank you!